Here’s the little bit of that. From time to time I might tell you about a book I’m loving or something along those lines, I’m not always deep or serious, and I LOVE to read. Let me give you a little back story; after I read Fifty Shades of Grey(Yes, I’ve read them and yes, I loved them. Judge me. I don’t care and P.S. I’m STUPID EXCITED about the movie), about two years ago, I read a book that I fell in love with; Gabriel’s Inferno by Sylvain Reynard. 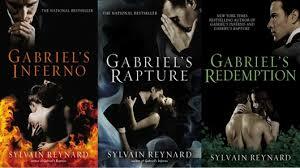 Originally it was only a two book series with Gabriel’s Inferno and Gabriel’s Rapture, but then it was requested that they write a third and final book, so the author obliged. December 3rd came Gabriel’s Redemption. Here’s the current part. I knew the author used a pseudonym, but didn’t think much about it until the conclusion, well let me tell you, am I blown away! The author is a male and chooses to keep his identity a secret so he can use his fame to bring his favorite charities to light. Now, not only do I love the story line of these books, but I think I may love the author as well. I loved the conclusion and may have cried(did cry) at the ending. If it is possible, I felt a little smarter after reading these books. The author is quit intelligent. If you love romance and were fond of FSoG, with these books being no where nears as gritty, I highly suggest you give them a read. Author littlebitsofme22Posted on December 7, 2013 December 24, 2013 Categories UncategorizedTags books, bookworm, Fifty Shades of Grey, Gabriel's Inferno, Sylvain Reynard, What i've readLeave a comment on Here’s the little bit of that.